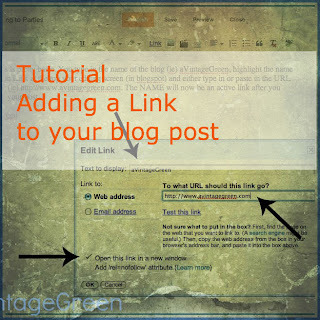 This post is for newer blog writers who want to add a link inside their post. Adding a LINK to your posts is straight forward. You start a NEW POST. In EDIT add your text and pictures. If you want to add a link to another blog post as an example or thank someone for having a great idea you can add a link back to their post. In your post type in the name of the blog (ie) aVintageGreen where you want it to appear in your post. 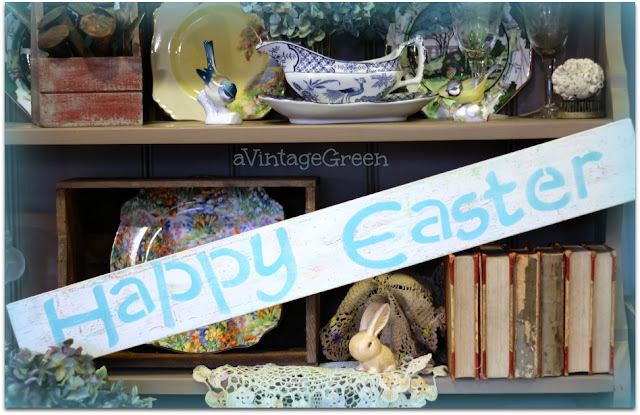 Highlight the name aVintageGreen. Make sure it stays highlighted while you link it. 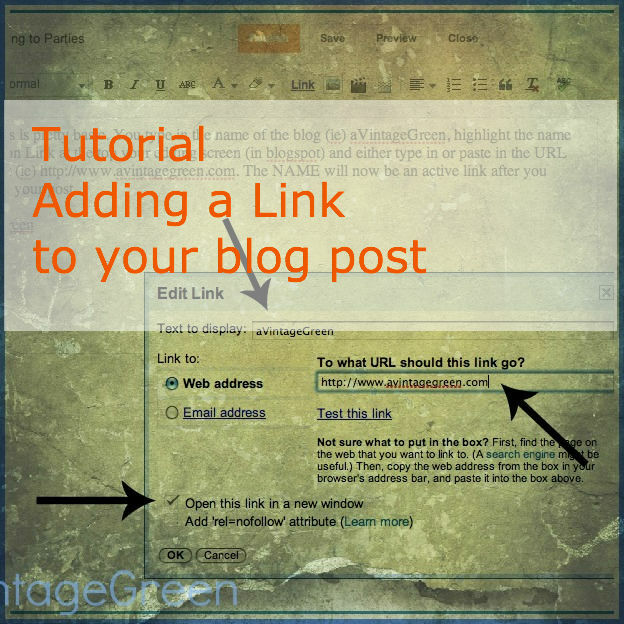 Click on Link at the top your editing screen (in Blogspot, I haven't tried this in Wordpress) and either type in or paste in the URL of the blog post (ie) http://www.avintagegreen.com. Make sure that you click on the little box beside Open this link in a new window. Click on OK.
You will now see your EDIT page of your post. Continue writing your post. When you are finished writing your post you Publish. 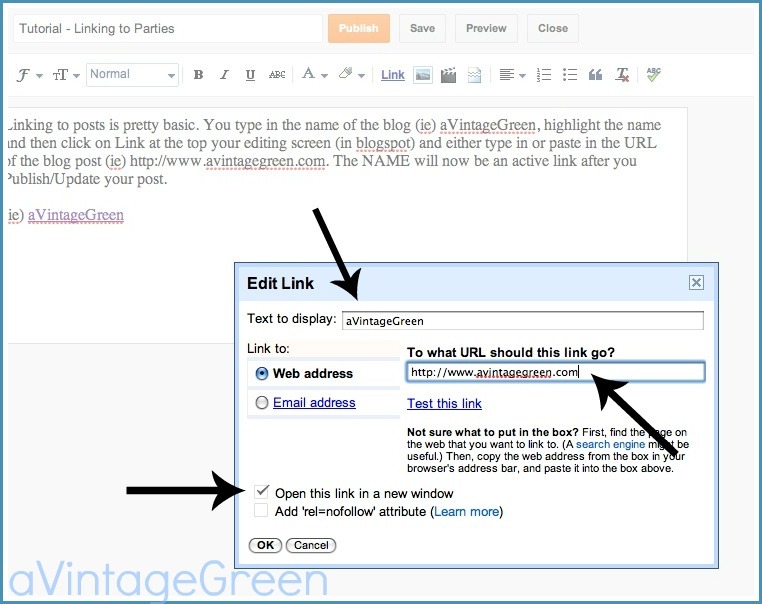 The Linked Post Name will now be an active link after you Publish/Update your post, (ie) aVintageGreen. hint: remember to check in the box Open this link in a new window. Screen shot of Edit Link with arrows showing the places where you enter your OWN information. Your post will now have an active link (or several if you add them). This is also the way you join in with Linky Parties. Next post will be more on joining Linky Parties. I used screen shot and preview/crop to capture the image from my computer. I used PicMonkey to frame, watermark and special effects for color. I used Pixlr to add the banner and Tutorial title. Thanks for sharing this tutorial at Show & Tell. I know a lot of people with appreciate it. Thanks for linking this tutorial to Time Travel Thursday. I'm sure it will be a big help to others. Thanks for the great information. I am looking forward to the Linky Party Post. I have never done that before. I am a newbie blogger (since January) and have sooo much to learn! Hi Joy, thanks so much for sharing this with Share Your Cup Thursday. Information like this helps new bloggers so much. I knew nothing when I started. I just started visiting other blogs last May. The first time I tried to link up with a party is was quite comical. I had no idea what I was doing. Great tip! Thanx for joining THt! Joy I cannot thank you enough for sharing this tutorial. I have been trying to figure this out for the whole 6 months I've been blogging. I appreciate it this so much. I'm looking forward to ALL your blogging tips and will implement them. PS I[m following you and would be delighted and thrilled if you would like to follow me back.